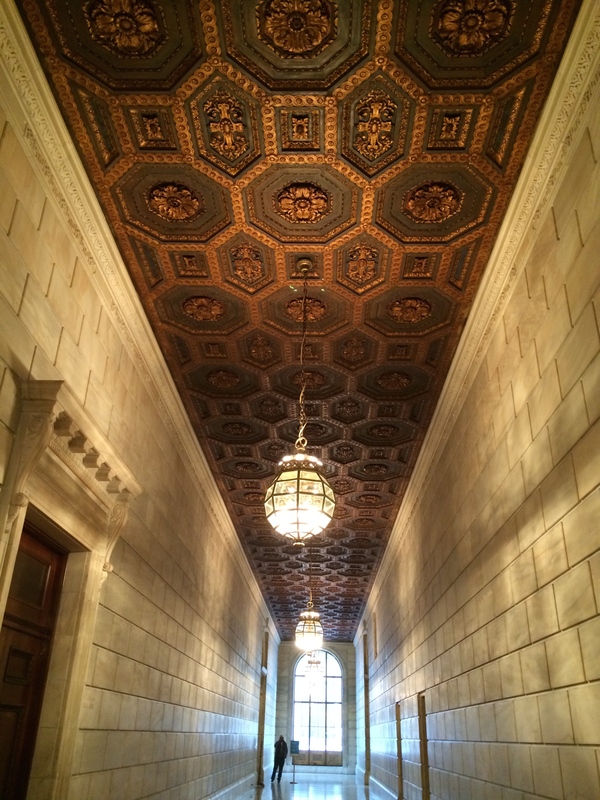 Oh, that building: New York Public Library, Stephen A. Schwarzman Building | Oh, the Places We See . . . Although we’re book lovers through and through, we don’t make it a habit to visit libraries wherever we travel. But maybe we should. 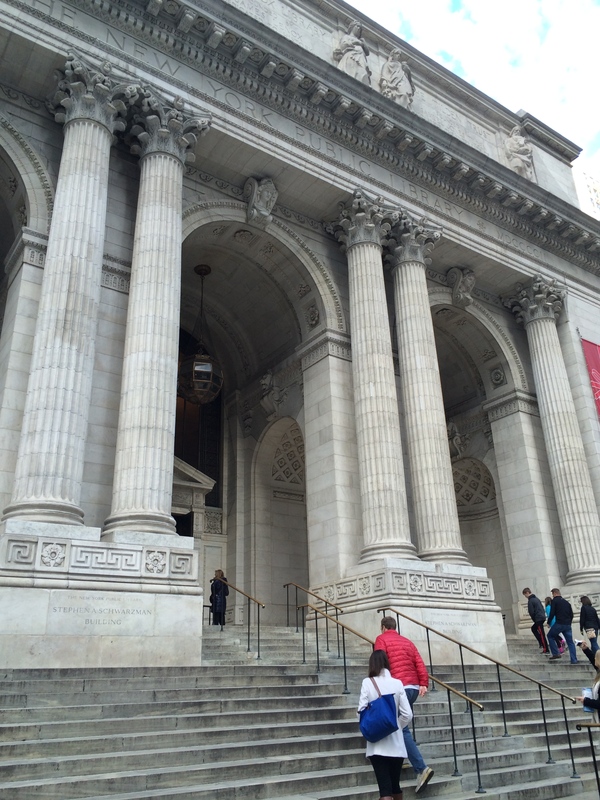 Now that we’ve seen the New York Public Library’s Stephen A. Schwarzman Building, we’re curious to know what’s inside other libraries. Or perhaps it just doesn’t get any better than this. 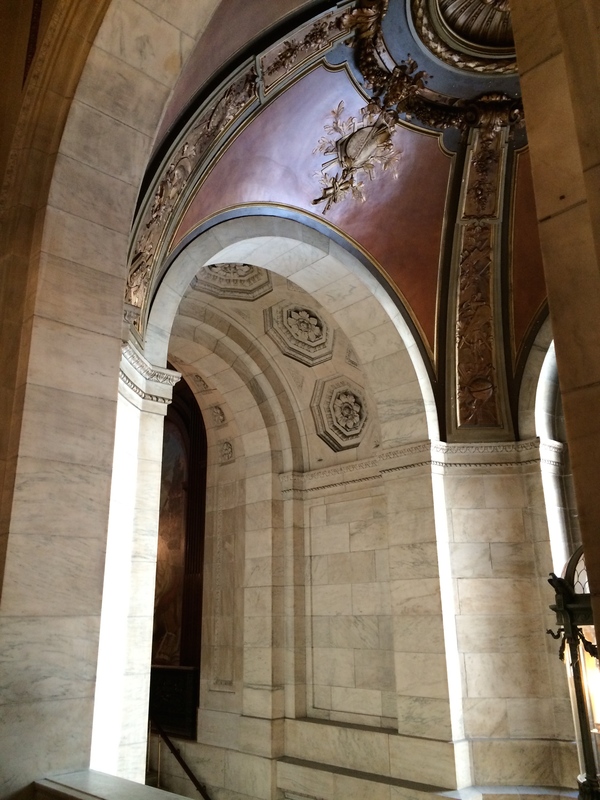 After all, the Schwarzman Building seems to have it all: Beaux Arts architecture filled with museum quality artwork, detailed frescoes, marble stairwells, and much, much more. 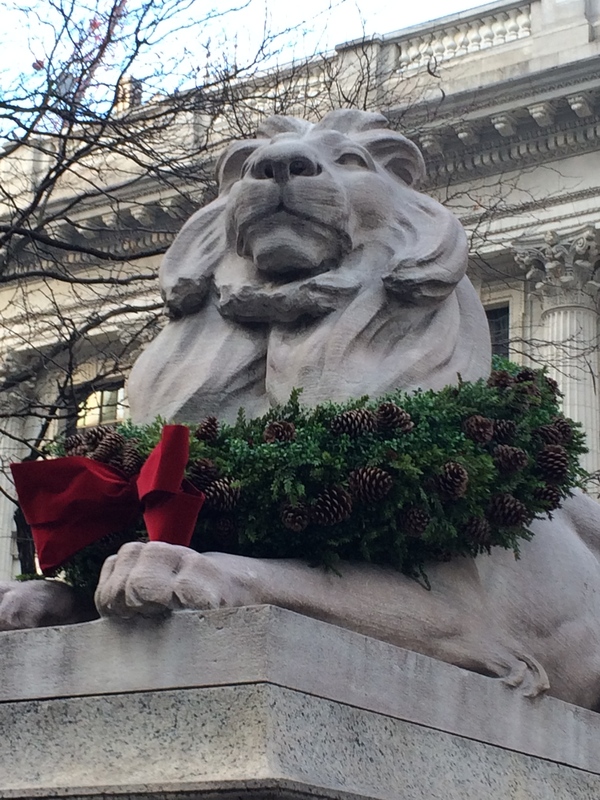 Greeting us on our December 2015 tour were the iconic, loved-by-everyone lions known as Patience and Fortitude, named in the 1930s by Mayor Fiorella LaGuardia who said they represent qualities that all New Yorkers needed to endure the economic trials of the Depression. Now these lions sculpted from pink Tennessee marble (See? We knew there was another reason to love ’em!) are mascots of the library, their trademark likenesses emblazoned on everything from t-shirts to tote bags. 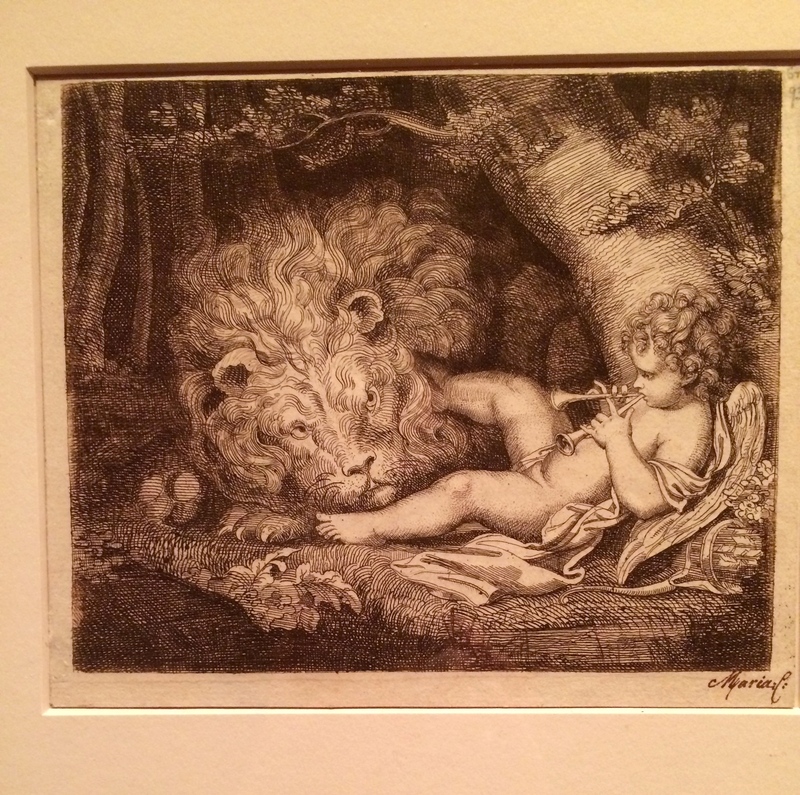 And lucky us — on exhibit while we were there (ending May 27, 2016) was a collection of prints, etchings, woodcuts, etc., belonging to Henrietta Louisa Koenen (1830 – 1881): “Printing Women: Three Centuries of Female Printmakers, 1570-1900.” Quite the collection. Beautifully showcased. 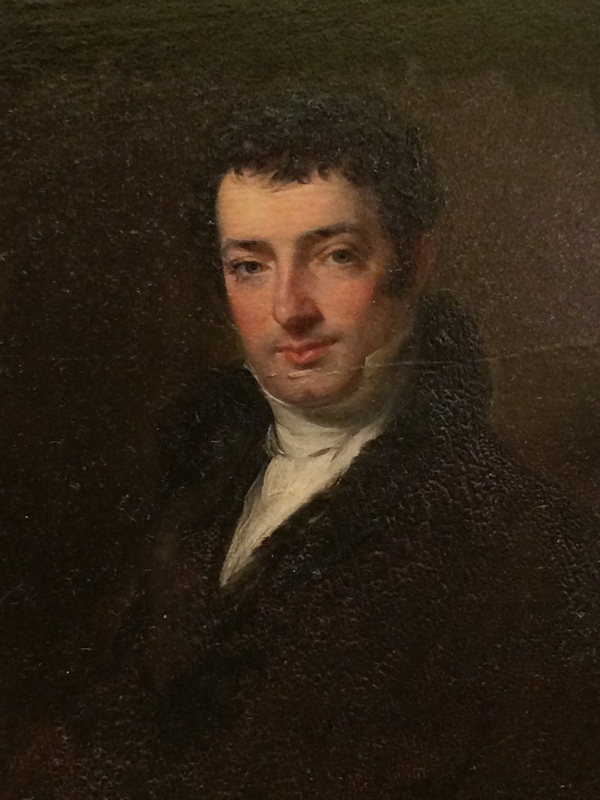 An upstairs reading room holds portraits — some familiar, some new to us. 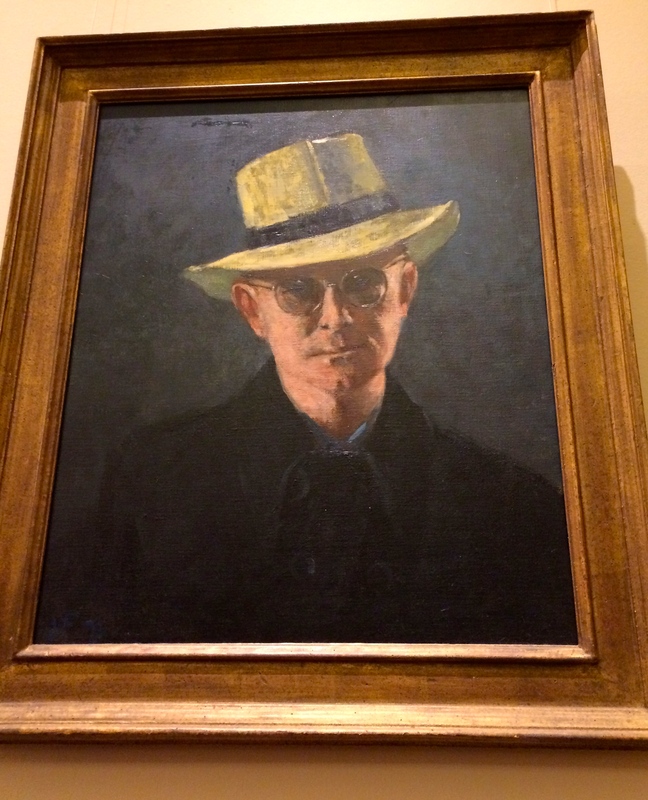 We were rather surprised, however, to see this portrait of Truman Capote by John Whitney Fosburgh among the “older” notables on the wall. Lest you think the New York Public Library is strictly for bibliophiles of a “certain age,” take a look at this area designed to hook kids on the joy of reading. What fun to see Patience (or is this Fortitude?) fashioned out of today’s “it” building material: Legos! At the end of our visit, we grabbed one of the free postcards that any guest can have for the taking. 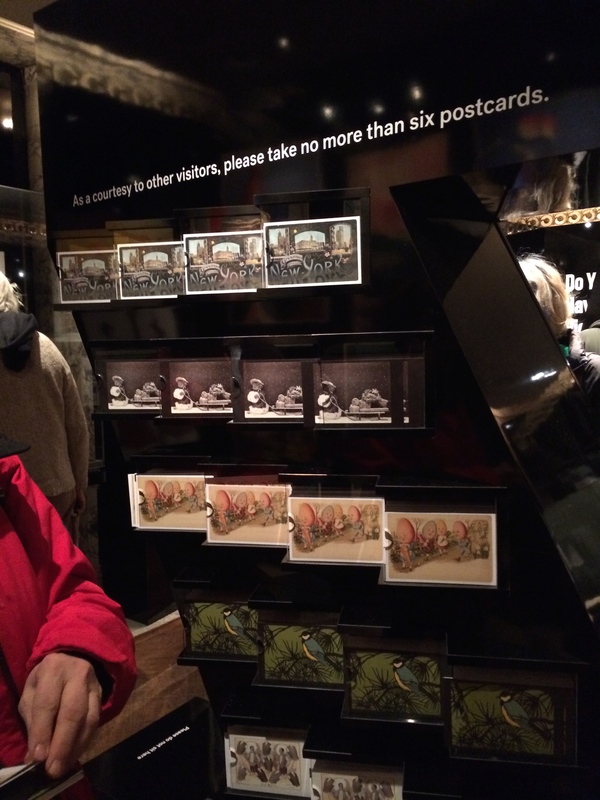 Free for the taking — but just one of each per customer: postcards from the New York Public Library! Then we made our purchases at the bookstore. Armed with pins imprinted with a Patti Smith quote — “Long Live the Library” — and tote bags for folks back home, we reluctantly left the building. 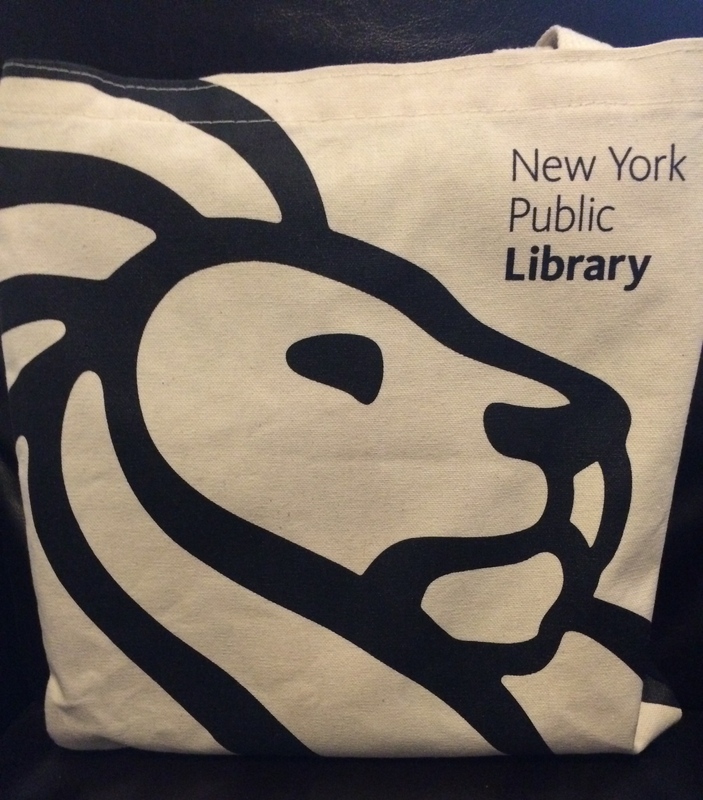 Those iconic NYPL lions show up everywhere — even on tote bags! 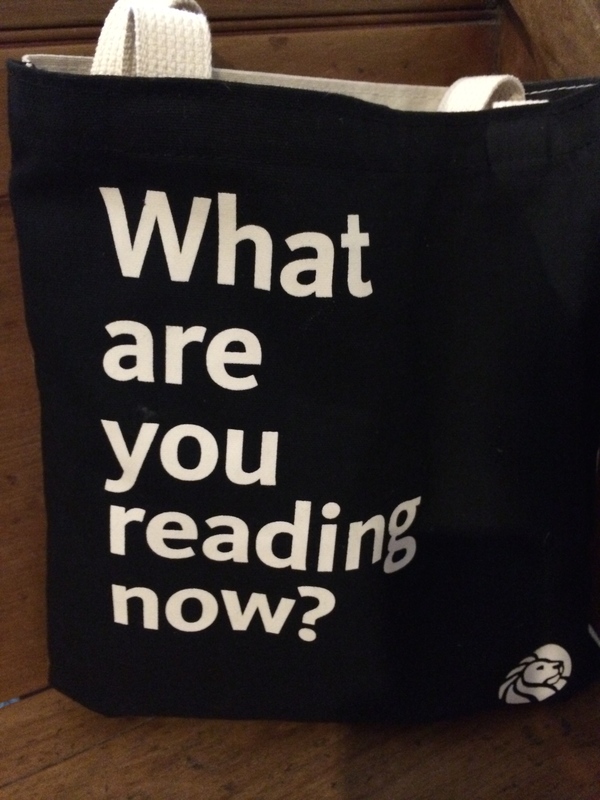 Great question for the back of the NYPL tote bag. What’s your answer? 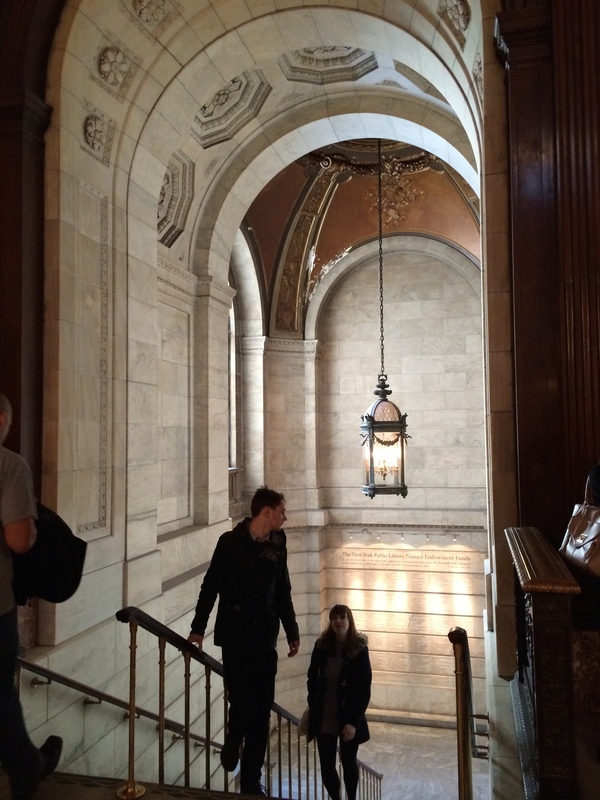 A return trip to NYC will warrant a return to NYPL. After all, there’s always something new going on at a library. And, with a building like the Schwarzman . . . Wow! what a place this is to see again and again! 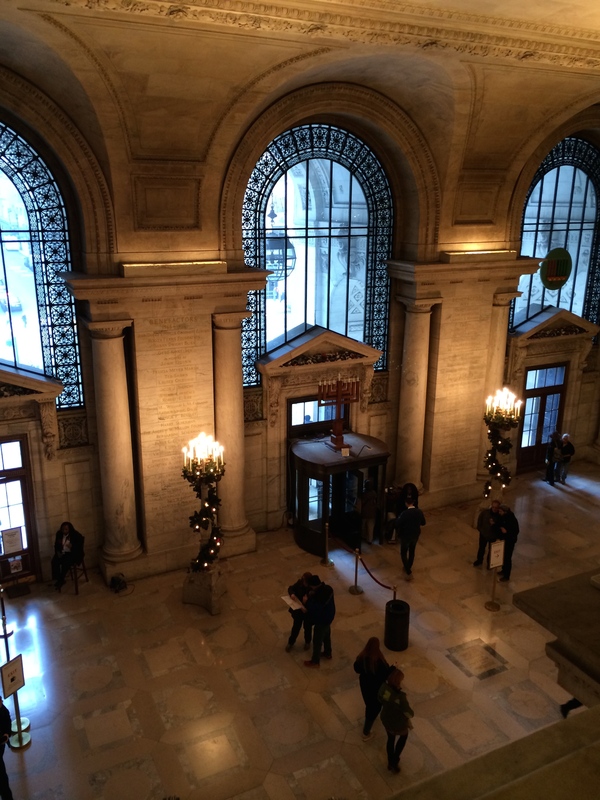 To read more posts from our Christmas Holiday NYC tour, click here. 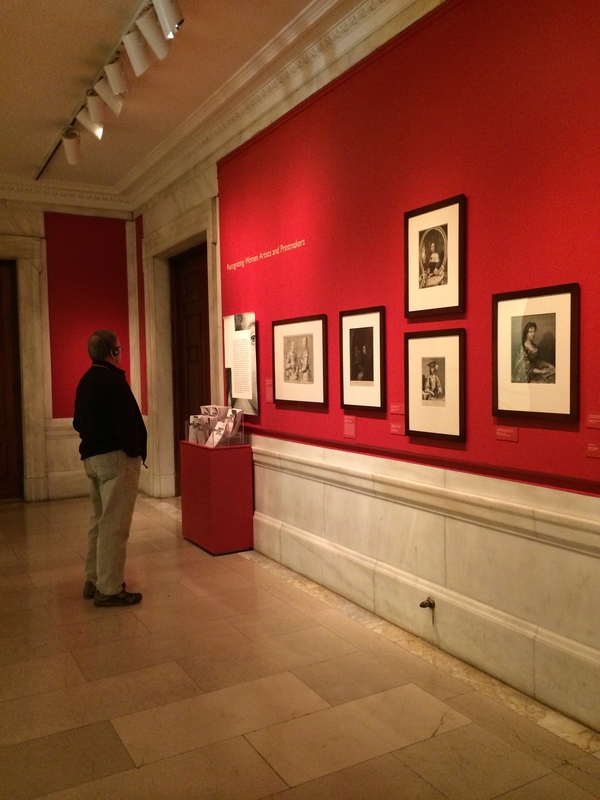 This entry was posted in New York and tagged John Shaw Bilings, New York Public Library, Patience and Fortitude, Schwarzman Building, Truman Capote, Washington Irving. Bookmark the permalink. Isn’t this place wonderful. I have spent hours here and could spend many more. NYC has so much character and history. I really loved this library, and would love to spend more time there. Brought home a tote bag and a t-shirt — I’m into it!!! Oh right. Its always good to buy artifacts to memorialize our adventures. Beautiful library, with nice architecture! Thank you so much! I’ve found that I like touring libraries, especially old, interesting ones. So maybe there will be more to come! Appreciate the comment. Your welcome… I’m just so Amazed with your work.. Such a beautiful building!! I Love New York and cant wait to go and explore it again some day! We love NYC, too. Just hoping I can get back there soon — maybe at a different season. However, it was pretty good this year in December — mild weather makes for great touring! just finished a new one purchased at Southern Festival of Books last fall: Pursuit in Provence by Phyllis Gobbell – reminds me of Louise Penny murder mysteries! Sounds good. I’ve finally “put to bed” The Bone Tree — long, but it grabs you. I just adore this place. Such an amazing building. I’ve taken some of my favourite pictures here. Great writeup nicely illustrated with images. Thanks so much for the compliment. What a pleasure it was to visit this library — the pictures just came naturally since there’s so much beauty to capture! Hope your week is going well, Sherry! love Libraries of all kinds and this would be a great place to visit on a trip… It is funny how everyone thinks of a library in their imagenation with those two lions they are icons of the whole library system. Please forgive me for not replying to this comment. I’m just now seeing it, but I’m wondering now how I missed it. 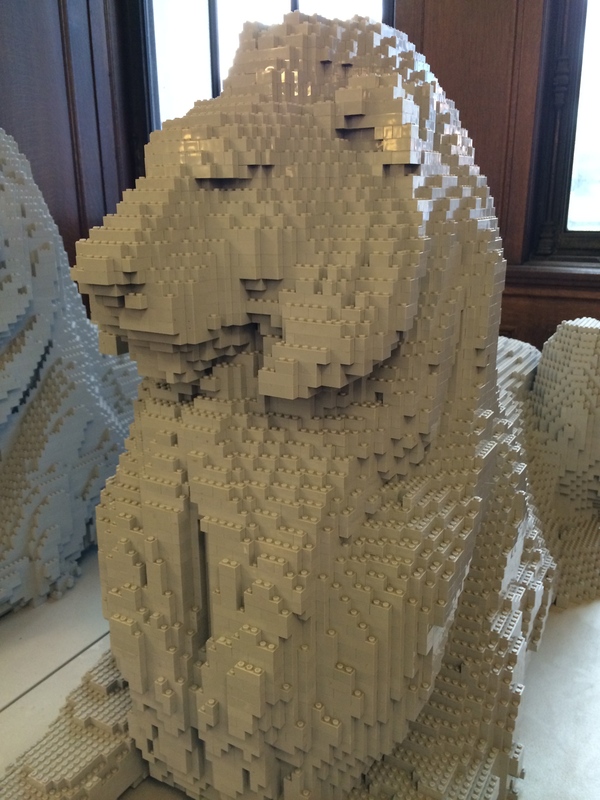 You are so right — those lions are iconic for this fabulous library. Hope you get to visit the building — it’s beautiful inside and out. What a lovely place to work! We met one volunteer who had been there for 35 years. Said she couldn’t imagine spending her days anywhere else. And we agree — it was calming and beautiful. What a great building with super initiatives going on all the time. This is a perfect time of year to curl up with a good book. America’s free public libraries are such gems and this one is the crown jewel! 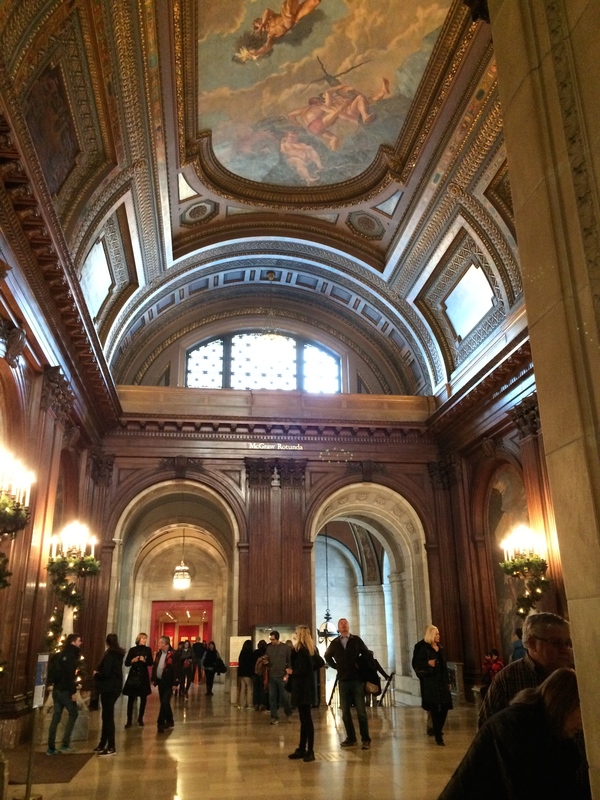 So true on all accounts — good time to read and NYPL being the crown jewel! Glad we put it on our to-see list. Would go back again! Thanks for commenting! A special and magnificent library! Love the architecture. Thank you for the tour, Rusha! Really great pictures of the art and structures! 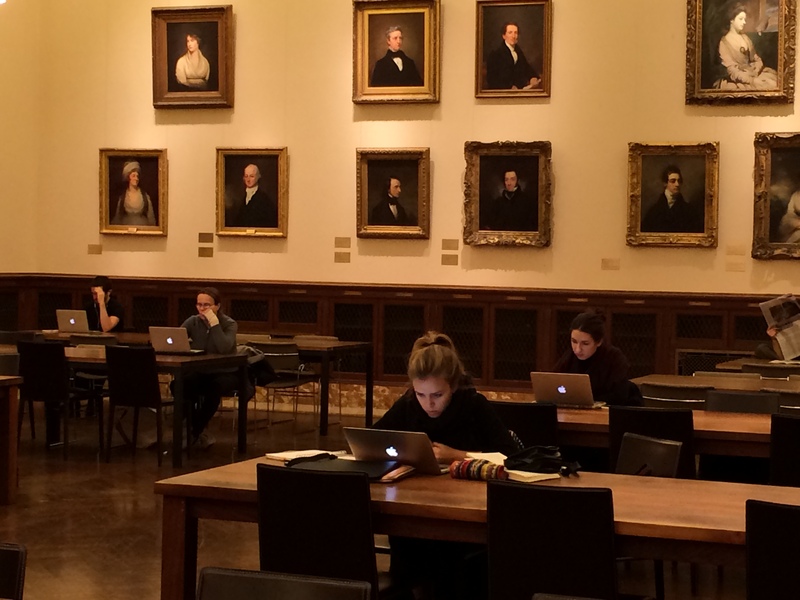 Thx – and my fav photo is the portraits one with all the kids on Apple laptops! That so artsy too! 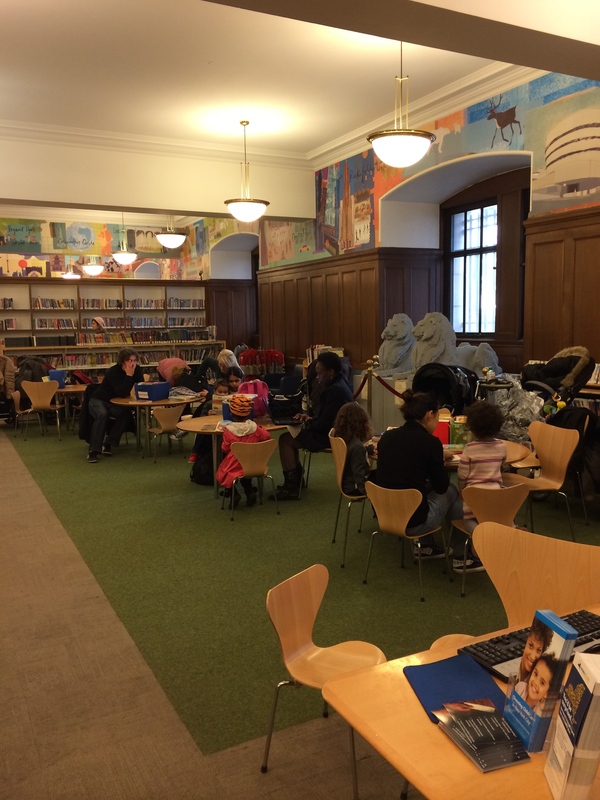 Loved seeing so many kids and their parents at the library together! What a great resource in the heart of the city! Thanks for taking a look. I always have two mysteries going – one on the table and one on the treadmill. I just finished a great Michael Connelly book, The Crossing.